The one thing about a family picnic is that everyone brings their favorite foods and after trying everything you do not have room for dessert so I always bring melons that we can munch on after when we are just sitting and talking about family things. 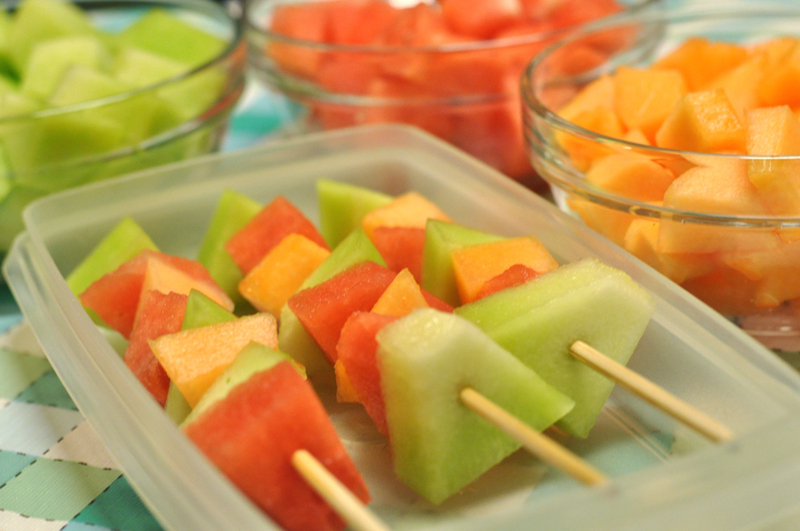 Cut your melons into bite sized pieces and arrange them on a stick to show off the bright colours. You can make them ahead and keep them in a sealed container in the fridge overnight or for a couple of days. Another great idea for the leftover melon is to make Melon Smoothies – all it takes is some melon and water (a mint leaf will boost the taste) put in a good blender and process for a few minutes until you have a wonderful smoothie! Melons have very high water content and they digest quickly so they are best eaten by themselves. Some great melons are watermelon, cantaloupe, muskmelon, and honey dew. Because of the high levels of water they are great to eat in the summer to help quench your thirst. A great way to get your daily amount of water! Melons are low in Saturated Fat, Calories, and Sodium, and very low in Cholesterol. They’re also a good source of Dietary Fiber, Niacin, Vitamin B6 and Folate, and a very good source of Vitamin A, Vitamin C and Potassium.